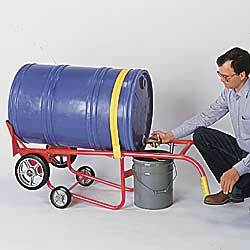 Now you can move full drums to dispensing stations safely and easily. Handles both 55- and 30-gal. standard drums. 1,000-lb. capacity. Spigot can be rotated to the bottom, allowing drum to be picked up from any side. 24"W x 56-1/2"H steel tubing frame. 10" x 2-1/2" and 6" x 2" wheels with grease fittings. IN STOCK. CRADLE WITH DISPENSING ROLLERS AND CHIME HOOK. Chime hook fits beneath spigot, no need to disengage. Non-sparking polyolefin rollers. CRADLE WITH OVERSIZE NOSE PRONGS AND BELT SYSTEM. XP-437 Wt. 70 lbs. Mold-On Rubber Wheels. XP-438 Wt. 92 lbs. Semi-Steel Wheels. XP-439 Wt. 70 lbs. Polyolefin Wheels. XP-440 Wt. 83 lbs. Mold-On Rubber Wheels.